Retired? Living in Florida? Coach Builders Inc. has the car for you. 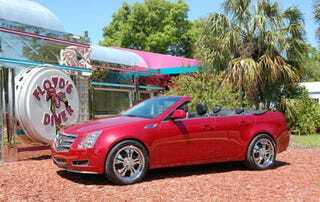 Perhaps tired of seeing our treasured senior citizens driving around in those awful Sebring verts, the company now offers a conversion that chops the top off the popular Cadillac CTS. While GM is planning a 2010 Cadillac CTS Coupe and CTS Wagon, CBI is giving the well-aged people exactly what they want. Of course, getting what you want always comes with a price.